Holes in a planter or container may seem counterintuitive, but true hydroponics aficionados know that you've got to set your roots free. The many holes in the bottom of these pots promote healthy roots with even drainage. Letting the roots grow their own way down through the pot, allows for bigger, healthier roots. 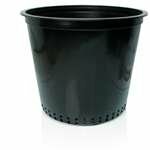 These pots work with any kind of media -- hydroponics or soil-based and are reusable and easy to clean. The comfortably-sized lip along the top of these containers, making them easy to grab, lift, and transport. Approximate volume: 4.5 gal.